Here’s a fascinating video of what impact looks like. Notice two things: first, how much the club slows down at impact. A lot of swing speed gets removed when the club meets the ball. It looks like the club doesn’t slow down when you see players hit on TV, but I’ve read that impact removes about 30% of swing speed (Newton’s Third Law), and this video confirms that number to be in the ball park. The second thing to notice is what happens to the clubface when the ball is hit off center. Do you see the clubface turning? That’s because impact was off-center. That decreases the distance of the shot, because some of the energy of impact is being used to rotate the clubface. Did you notice, with the putter, how the ball slides across the grass rather than rotates? For the first few feet of a putt, the ball does skid along the ground before it starts turning. You might not think that a putt has trajectory, but it does. The skid you’re seeing here is what you want. If your putter face is too lofted at impact, or too delofted, the ball will hop, not slide, and distance will be affected. Contact between the club and the ball in these shots lasts 1/2,000th of a second. Note also that these films do not support the myth of backspin being created by the the ball rolling up the clubface. You hear athletes talk about The Zone all the time and about the two or three times in their career they were in it. You night think this experience is available only to elite athletes, but anyone can get in. You’ve been in The Zone many times (OK, I’ll stop capitalizing it now). Have you ever had a 20-foot putt that you just knew was going in before you hit it? You felt as good about this one as a 6-inch tap-in? Or an iron that you knew before you hit it would go straight for the pin? That’s the zone. You have those moments all the time. Here’s another one. You go to the range, do a bit of stretching to get warmed up, then hit the first ball with your pitching wedge using a lazy, getting-loose swing. The ball takes off right where you were aimed, high, and far — the best PW you could ever hit and you hit it without thinking about it. There’s the catch. You weren’t thinking about it. What it means to be in the zone is that your mind is quiet and the movements you have trained your body to do just come out. Here’s another one. You’re on the practice green having indifferent results, and you decide to do something different. It could be anything, like changing your stroke, your grip, your setup, anything. And what happened but you drained three 10-footers in a row, dead center. Now you thought that this one thing you did was the key to the kingdom, but as soon as you thought that, you started being your old self again. That’s because the thing you did differently took your mind off what you had been thinking, and temporarily gave it nothing to think about. You were in the zone. Then, after the third putt, you started thinking about something again, and bye-bye zone. So that’s the zone, which I know you’ve been in many times, and you know, once it’s pointed out to you, what it is. The questions that remain are how to get into it at will, and how to sustain it once you’re in. Not so easy to do and not so easy to explain. All I can say is that it takes deep spiritual training which must be continuously renewed. I would recommend visiting a Ki Society training center, which are located in most major population areas around the country. Good luck. By now, most golfers know that the most important element of the putting stroke is to return the putterface squarely to the ball at impact. Golfers also know that this is difficult to achieve. I would like you to try this tip to see if it doesn’t improve your putting in this area. It has to do with your grip. In the full swing, if your grip is too weak, your hands will return to a more natural position at impact and the clubface will be open. In the same way, if your grip is too strong, your hands will rotate back to a position that closes the clubface. Even though the putting stroke is relatively much shorter, the same principles apply. It behooves you to experiment with different placements of your hands on the putter so that your hands return the putterface to the impact point square. It’s not very hard to do. A few slow-motion strokes will do it. When I tried it, I ended up with a fairly strong grip, much stronger than what I use for a full swing. But, given my putting setup and stroke, this grip does the job. It’s a small point, but it might help. 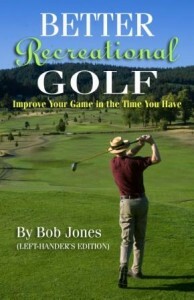 Everybody knows that the easiest way to get a good score is to hit the green in regulation. Let me suggest to you an equipment strategy that will help you do that. I would imagine that you have one club which you like to hit more than any of the others. Whenever you pull this club out of the bag, you know good things are going to happen. If you’re smart about it, you will hit that club as often as you can. Let’s say it’s your 6-iron, and that you get 160 yards out of it. If that’s how far you are from the green, you’ll hit it, of course, but if you’re 150 yards away, you can grip down and hit from that distance, too. 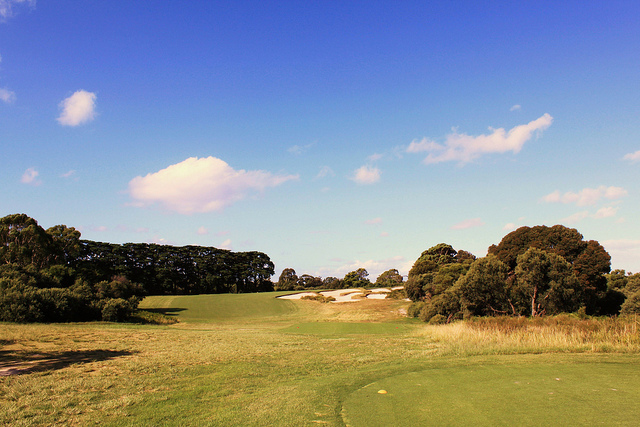 Say it’s a par 5, you’re 260 yards from the green, and you’re playing your second shot. Why not hit the 6? That will put you 100 yards away, which is an easy pitching wedge into the green. And so on. You should follow a strategy of putting yourself in a position to hit that favorite club as often as possible. 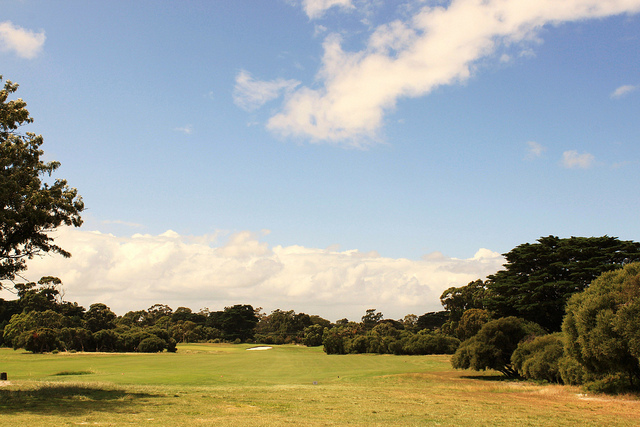 Use that one club to get your ball around the course. Now what if you had four clubs like this, not just one? Four clubs that you knew you could rely on, that you never had to worry about? That would make the game really simple to play. It’s the way I play. I practice almost exclusively with my driver, 4-hybrid, 7-iron, and pitching wedge. I try to set up the hole so I can hit one of those three clubs into the green as often as possible. The 4 goes 180 yards, which covers the longest second shots on a par 4 that I’ll have, the 7 goes 150 yards, and the wedge goes 120. That’s three clubs to cover a 60-yard interval, each of which is a good friend. It’s not that hard to take off distance, so that if I have 160 yards to the hole, I’ll still hit the 4. How about 155? OK, I’ll use a 6-iron, but for most of the yardages inside that 60-yard interval, it’s one of those three clubs. There’s one hole on my home course where this strategy expands and pays off in spades. It’s 423 yards long, par 4, dogleg right, with water right and OB left. The landing area for the drive is very narrow. The golfers I play with are happy to walk off the green with a 5, and a 4 is as good as a birdie. I tee off with a 4 into the fairway, short of where the fairway narrows between the water and OB. I play my second shot with the 4 over the corner of the water hazard and am left with about 35 yards to the pin. I chip on and have a par putt. What could be simpler and safer? I have committed my game to this four-club strategy and it works great. I have found a way to get the ball into the hole in as few strokes as possible by narrowing down the shots I have to hit to just a select few that I hit very well. Earlier this year I took these four clubs, along with a 2-hybrid, a 54-degree wedge, and a putter, to a course I hadn’t played before, and shot 81. Not bad. There’s a current article on the Golf Digest site about how to choose the clubs that go in your bag. With all due respect to Golf Digest, and speaking as someone who plays golf and whose income does not depend on advertising from equipment manufacturers, here are my thoughts. 1. “Anybody still fighting a slice is merely being pigheaded” If you’re fighting a slice, get a lesson or two, and practice until it’s gone. Take responsibility for your own errors instead of asking an adjustable club to fix it for you. While you’re at it, take responsibility for your life instead of asking someone else to fix it for you. 2. “Understand the effects of adjustablilty” If you adjust a clubface more open, you deloft the club? OK, I won’t argue. Just show me. 3. “Driver technology is trickling down to fairway woods” This is about adjustable fairway woods. See #1. 4. “Brand loyalty can have a negative effect” True. When I bought my irons, I tried out eight different brands. Only two felt right. The ones I rejected are played by lots of touring pros, but they weren’t the clubs for me. 5. “It’s OK to have “mongrel’ clubs in your bag” True. Whatever gets the ball in the hole. I have a 56-degree Ben Hogan Sure-Out sand wedge in my bag that gets the ball out of the bunker, gets the ball out of heavy grass (there’s a lot of metal down there that will not be denied), and works great from the fairway. Sometimes I include a Ray Cook chipper. 6. “Unless you’re practicing eight hours a day, you have no business hitting muscleback blades” B***s***. Anyone can hit blades, and I think everyone should. GI irons are a compromise. Blades give you better feel of impact, and have a more rewarding (though smaller) sweet spot. You can play hybrids, 2-5, and blades, 6-PW, and do just fine. The only reason manufacturers tell you not to play blades is to get a return on all the money they’re pouring into something else. 7. “Better players are doing themselves an injustice if they don’t have one or two hybrids in their bag” True, true, true. These clubs are so easy to hit it’s almost cheating. There’s no reason for a recreational golfer to be carrying a 2-, 3-, or 4-iron anymore. 8. “Testing equipment needs to include time around the green” Very true. 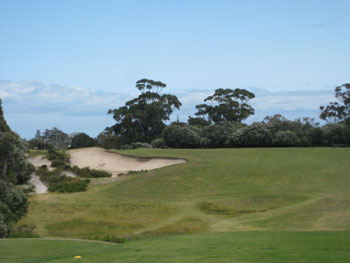 Buy your wedges and putter at a place that has a real green where you can hit balls. A big box store isn’t that place. Make sure you test golf balls, too, but that’s another article. 9. “Super Game Improvement irons aren’t just for Grandma anymore” See #6. They really want you to buy these clubs, don’t they? 10. “Simplicity and feel still have their place in putters” Oh, my. Putters these days look like they came off an alien spaceship. Do get fitted for a putter, but keep it simple. I play an Acushnet Bulls Eye, made in the early 1960s, and I do just fine. 2. Every so often, new equipment comes out that truly does make a difference. Hybrid irons, for example. The rest of it is the manufacturers trying to get their hands inside your wallet. 3. A $400 driver = eight lessons. The lessons will take more strokes off your game. 4. In the end, it’s the singer, not the song. From time to time, I put videos on my web site to show you how to hit troublesome shots. Today’s video shows you a drill that will help you make short putts, the ones from 2-3 feet that you just can’t miss. I blogged about this over two years ago, but I thought it would be a good idea to show you what the drill looks like. Believe me, it works. If you do the drill often enough, your mind actually does come to believe that there is a bottle in the hole even though your eyes see that there is not. Your mind taps into the feeling of confidence it has when you practice with the bottle, and you putt with that feeling. On the course, you could say that there isn’t really a bottle there, and in one sense, you’re right. But when you have done this drill a number of times, your mind will react to the situation as if there were a bottle in the hole, and that is just as real. What is in your head is much more important than what the objective facts are. If your mind is convinced there is a bottle in the hole, then there is. It doesn’t matter what other people would say. If your mind believes it, that’s enough. There’s a lot more to golf than training your body. You need to train your mind as well so what you have trained your body to do will be expressed. If you practice this exercise, I think you’ll see that I’m right about that. No one expects you to know all the rules of golf, but there are a few rules about commonly-ocurring events which the golfers I play with seem to get tripped up on or just don’t know. Here are some confusing procedures simplified, with the rule book reference in parentheses. You can see that if you’re just taking relief, it’s one club-length. If you’re taking relief and have to take a penalty stroke as well, it’s two club-lengths. If you just want to knock the ball around, who cares about the rules? But if you’re writing down scores, it’s best to follow them. When I was growing up, there was a set of golf clubs in the basement. There was a steel-shafted wood of come kind, and several irons with wooden shafts. I don’t really remember much more than that, but I do remember that they fascinated me. They belonged to my father (they had, too, my mother was tennis player, and a good one), but he never played. He must have played when he was younger, but like so many men do, when his family started, along with that and his job and his avocations, there was no time for golf. But the clubs were there. There was a heavy canvas shag bag, too, along with a few of the old-style balls that had dimple patterns that ran at right angles to each other, very orderly. When I got my first set of clubs, the one that I liked the most was the 9-iron. Maybe it was the shape of the numeral on the sole of the club (an early fascination with typography that continues to this day), I don’t know. The other clubs were golf clubs, but my 9-iron was Golf. I had a dozen Wilson golf balls, Jim Ferrier model. Later I became a big Maxfli fan, because their ball logo was a colored dot with a circle around it. I went for the green-dot versions in a big way. Even today, I mark my golf ball with one green dot. 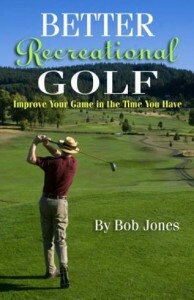 I had a book, too, called Play It Pro, Golf from Beginner to Winner , put out by Wilson Sporting Goods. 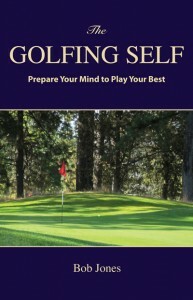 It’s a slim paperback, only 66 pages long, that takes you through equipment, how to swing, chip, putt, get out of sand, and so forth, along with a bit on professional golf. I still have the book, and there is a chart in the back where you could enter your scores. My first time breaking 100 is marked on that chart, when I was trying out for the high school golf team at about age 15. I took group lessons when I was nine or ten, at a driving range that had a par 3 course attached. I thought it was really easy. The pro said to do This, so I did This and it worked. I couldn’t figure out why no one else was doing what he said to do. We couldn’t afford too many lessons after that, nor too many rounds of golf, but I did get some plastic balls and hit them all the time in front of my house during the summer. There weren’t many kids in my neighborhood, so I didn’t have anything else to do. The telephone wire into our house ran about twelve feet above the ground and just in front of the spot where I would hit from. I would take a real golf ball and see how close I could get to the wire and still be able to pitch a ball over it. I could get pretty close. Getting a short shot in the air in a hurry is still pretty easy for me, because of that. My father took me to my first professional golf tournament, the Portland Open Invitational, when I was ten. What I remember most is watching the players warm up on the range. In those days, the pros had to bring their own range balls, so their caddies were all down-range picking up the balls that their pro hit to them. Right to them. I couldn’t believe what I was seeing that someone could hit the ball that straight time after time. One more memory before I go, which I have to, lest this essay turn into a volume. I was about eleven years old when my father and I went to see Patty Berg give a clinic on the 10th fairway of our local golf course. There wasn’t a lot of money to be made on the LPGA tour back then, and this is how she made her living. It was amazing the amount of control she had over the ball and how it did exactly what she said it would do. I got her autograph, and I still have that, too. I would tell you about the day I got Arnold Palmer’s autograph, but that’s post in itself. Soon.